The judge, Sir Michael Astill, said the men, all British citizens, had "betrayed their country". 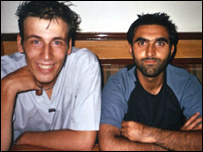 Omar Khyam, 25, from Crawley, West Sussex, was found guilty of conspiring to cause explosions likely to endanger life between 1 January 2003 and 31 March 2004. Also convicted were Waheed Mahmood, 34, and Jawad Akbar, 23, also of Crawley; Salahuddin Amin, 31, from Luton, Bedfordshire; Anthony Garcia, 24, of Barkingside, east London. The judge told them: "You have betrayed this country that has given you every opportunity." He also warned them: "All of you may never be released. It's not a foregone conclusion." 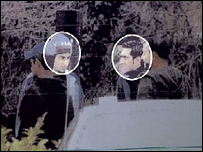 Two other men, Nabeel Hussain and Shujah Mahmood, were found not guilty. The call for an inquiry was echoed by Graham Foulkes, whose son David died in the 7 July attacks. He said an inquiry was needed so "lessons could be learned". But he said a committee of MPs would analyse the lessons learned from the fertiliser bomb plot trial. The new director general of MI5, Jonathan Evans, issued a statement in which he denied being "complacent" and added: "The attack on 7 July in London was a terrible event. The sense of disappointment, felt across the service, at not being able to prevent the attack (despite our efforts to prevent all such atrocities) will always be with us." He added: "The Security Service will never have the capacity to investigate everyone who appears on the periphery of every operation." Britain's top anti-terrorist policeman, Deputy Assistant Commissioner Peter Clarke, said: "This was not a group of youthful idealists. They were trained, dedicated, ruthless terrorists who were obviously planning to carry out an attack against the British public." The link with 7 July was deliberately kept from the Old Bailey jury for fear of prejudicing their deliberations on the fertiliser bomb plot. The trial was one of the biggest and most expensive in British criminal history. The fertiliser bomb plot investigation linked back to senior al-Qaeda figures in Pakistan and Afghanistan, including one who was detained by US forces in Iraq at the weekend. The Old Bailey heard the plotters had come together over a number of years. The men had started out sympathetic to Muslim causes around the world - but the key plotters decided that violence was the answer as they came together for secret military training camps in Pakistan. Back in Britain, they discussed various schemes, including targeting the Bluewater shopping centre in Kent on a busy Saturday or the Ministry of Sound nightclub in central London. They also talked of attacking the gas or electricity network and Prime Minister's Questions in Parliament. The group had bought 600kg of ammonium nitrate from an agricultural merchants and kept it at a storage unit in Hanwell, west London. This fertiliser was to be the key component in the massive bomb - similar to those used in other terrorism attacks around the world. But unbeknown to the men, some of them were already on MI5's radar while, at the same time, staff at the storage unit tipped off police. They replaced the ammonium nitrate with a harmless substance and kept the group under surveillance before swooping in a series of raids. The Old Bailey heard the defendants had at least two fellow conspirators. One of them, an American called Mohammed Junaid Babar, admitted his role in the plot after being arrested by the FBI and became a vital prosecution witness. The other was Mohammed Momin Khawaja, awaiting trial in Canada. The jury deliberated for 27 days, a record in British criminal history. 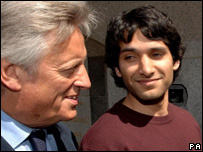 A Crown Prosecution Service spokesman said the deal allowing Babar to testify was unprecedented in British courts. Outside court a solicitor read out a statement on behalf of Nabeel Hussain. He said: " I have always maintained my innocence of the allegations against me. I have never been an extremist or believed in extremism... I am so glad this ordeal is over." 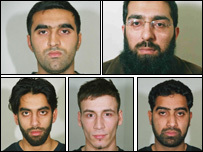 How are the fertiliser bomb plotters linked to other extremists in the UK and abroad? Find out the full story on Newsnight at 2230 BST on Monday.